The Kitchen Garden – Dig Delve – An online magazine about gardens, landscape, growing & making. 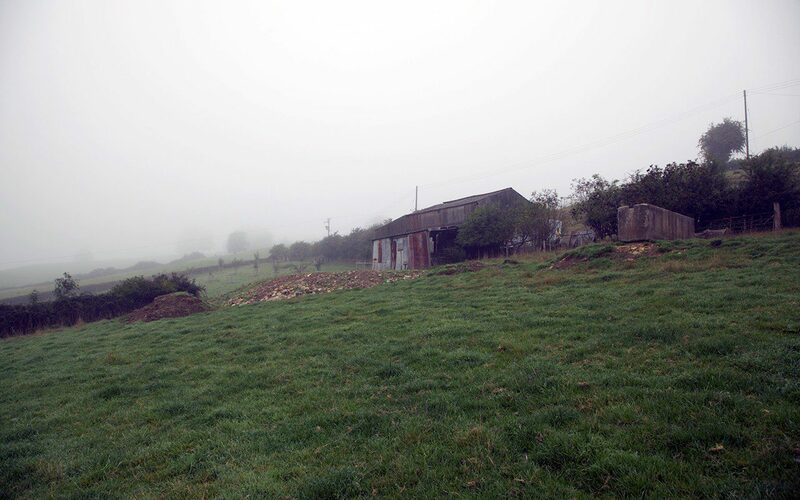 When we arrived here the flat ground was literally no more than a strip in front of the outbuildings. We perched a table and chairs there to make the most of not being on the angle. 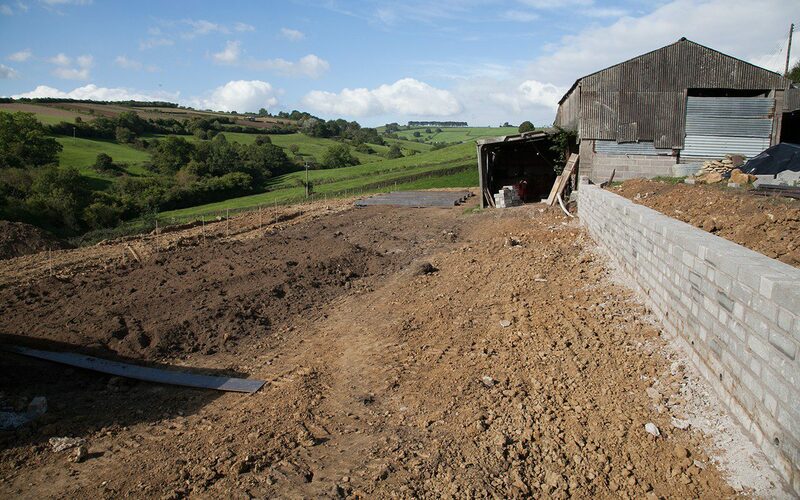 The floor of the boot room and those of the outhouses, the barns and levels of the farmyards were a patchwork of concrete, poured in mismatched batches and at a rake with the slope. The acuteness of the land had been diminished to create these spaces, but only enough to ease the grade. 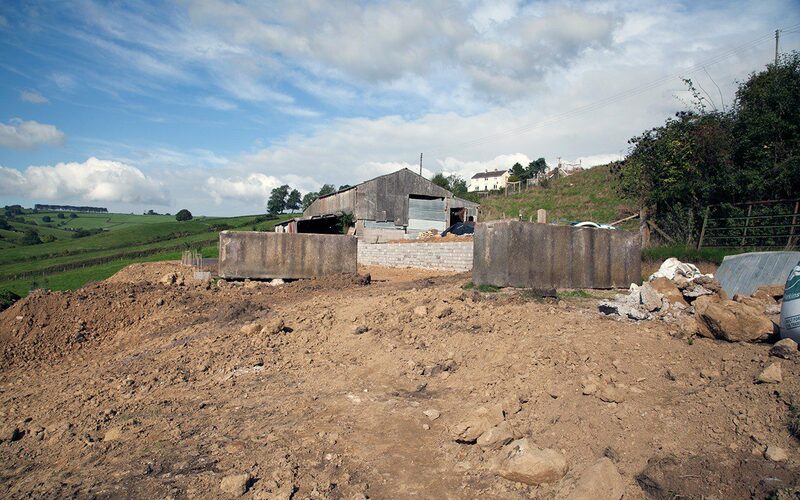 I didn’t know until we set out to create a new level why the farmer before us had minimised his excavations. Cut into the land and you quickly find the spring line. Two summers in it was clear that we needed a dedicated garden for fruit and vegetables. They were being challenged for space in the trial garden and we had become tired of negotiating the slopes for the detailed work that is part of growing your own. Sowing, thinning, weeding and harvesting on a slope were all that much harder with one leg shorter than the other and tools and buckets balanced. Beyond the tin barns the newly planted orchard was beginning to show, and the barns were the natural anchor point for a productive garden. We planned to grow figs and espaliered pears against the south facing breeze block walls of the barns and, on newly flat ground, soft fruit and vegetables, both annual and perennial. The first step in the process was made in October 2012 with the installation of a pair of monolithic 18th century granite troughs. I had three in total, brought all way from Yorkshire, but originally from eastern Europe where they had been used for tanning leather. They were magnificent things and I planned a pair as a division between the house and the long view west to the new kitchen garden. It was a Herculean task to get them in place. 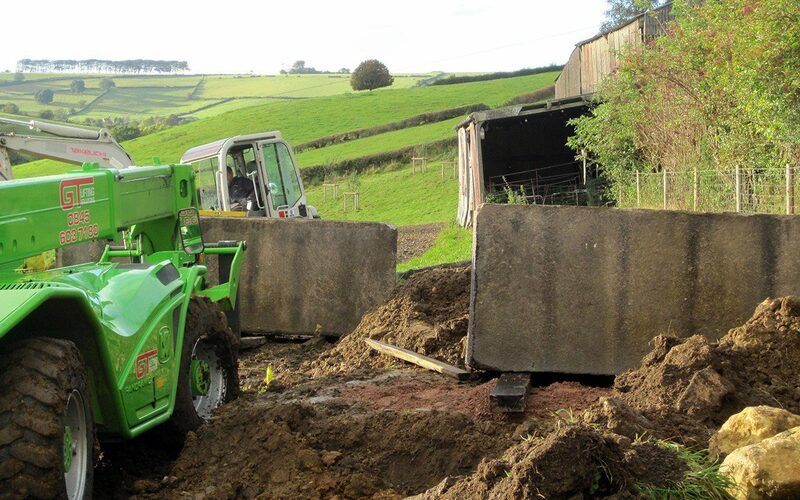 Each weighed four and a half tonnes and, in combination with the fifteen tonne fork-lift used to move them, the track collapsed and the concrete farmyard literally buckled under their weight. In the process we lost the drains from the house as the fork-lift crushed them, but my landscaper who was driving never flinched as the trough tilted the machine at a perilous angle. We threw rubble into the ruts and started again and, though it took all day to inch them to where I wanted them, they eventually reached their positions. 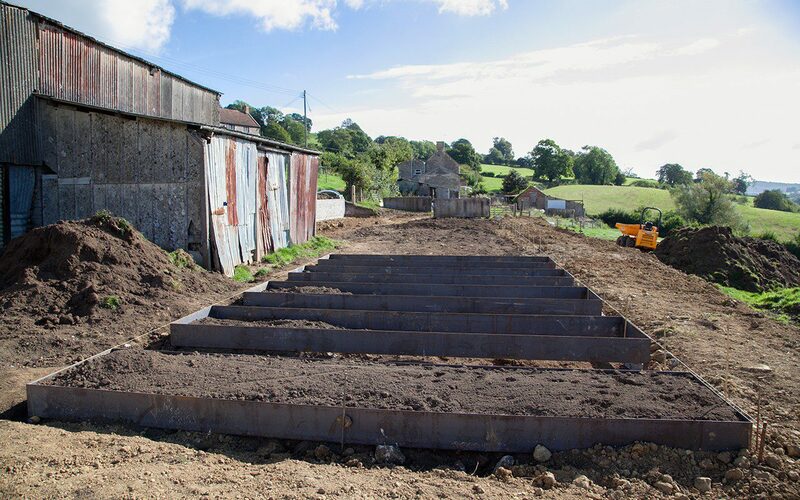 I wanted the troughs to sit as an offset pair, running across the spine of the new level that links the house with the barns. Here they would act as a gateway to the vegetable garden, while also screening it from the house and defining the space. Their bold outline would echo the straight line of trees on the distant horizon. One would be filled with rainwater from the roofs for hand-watering, the other would eventually be fed by the disused hydraulic ram pump down by the brook in a long-term plan to refurbish it. When you passed between them, an orderly set of beds would run like ribs north south off the east, west axis. The orientation of the beds would allow for the best and most even light for each of the crops. Nearly a year later in the last week of August and riding good weather for the best part of three weeks, we started the land-forming to create the garden beyond the troughs. 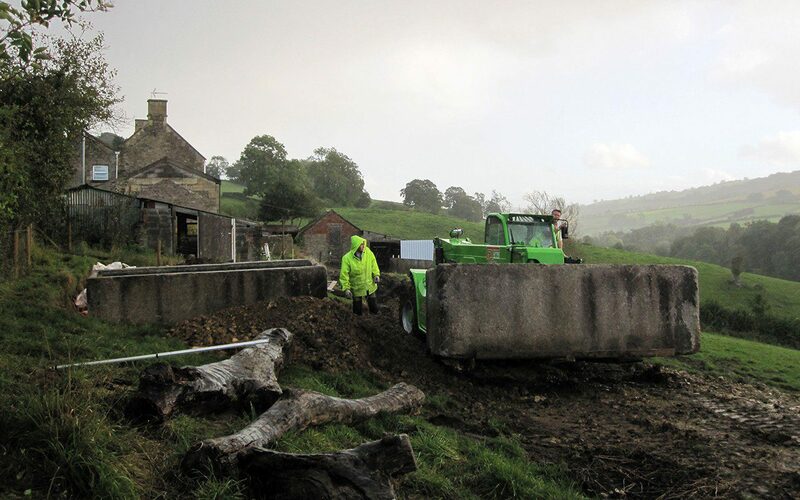 The digger scraped back the slope to make a spine of flat land between the house and the barns, while another cut made to level a sloping track in the field above the house provided the subsoil to make up the level from the barns. 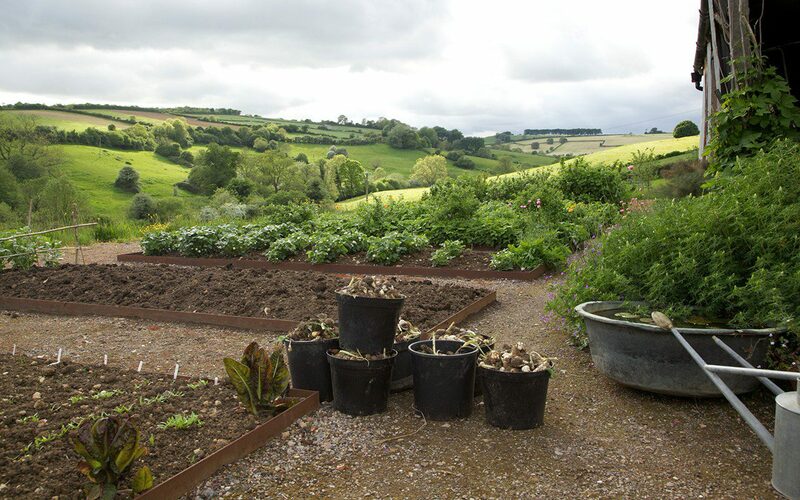 A breeze block wall was made to hold the land to the upper side of the spine, and provided the garden with a wall for espaliered pears and shelter for vegetables that would like the radiant heat – an asparagus bed, globe artichokes, courgettes and climbing beans. Breeze block felt like the right material to use as it sat well with the agricultural aesthetic in which things had been built in the past. 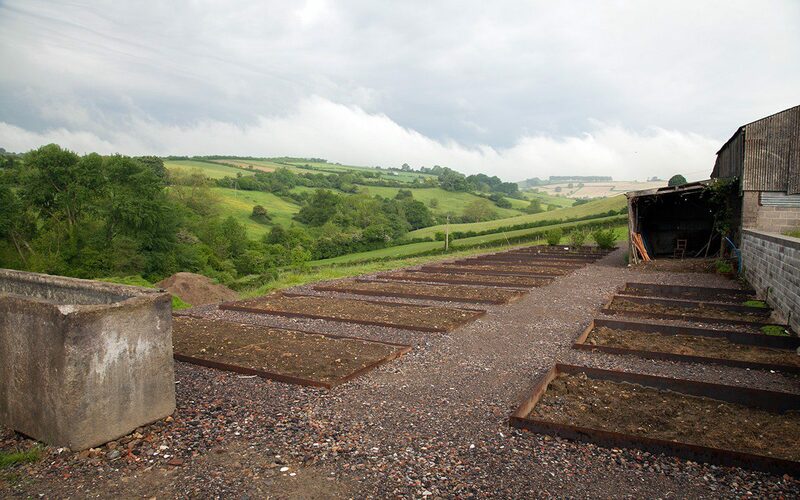 The topsoil, and the turf that came with it, were harvested and piled in the field below the new garden. It was stacked wider than it was high at 4’ or so, because if you stack soil higher the soil bacteria at the bottom of the pile get smothered and the soil becomes infertile. The sod rotted down to add organic matter, as the pile had to stay where it was until the following summer for, in mid-September, the rains came and made the site unworkable. 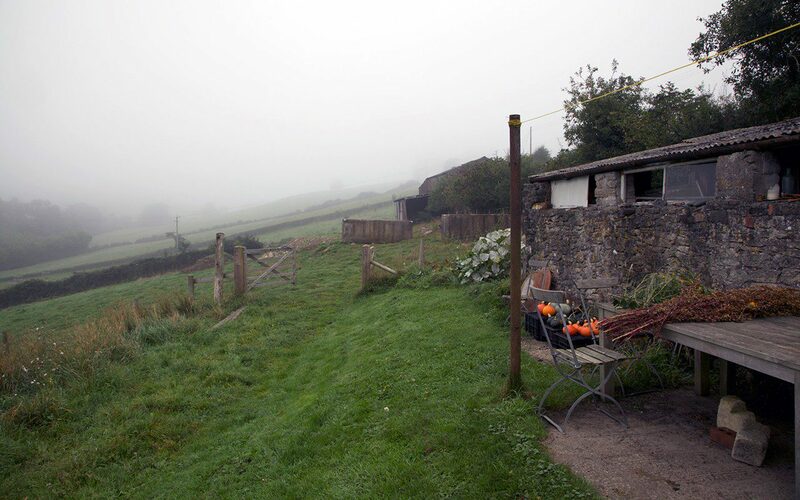 The scraping revealed the rubbly limestone brash that was perfect for making up the levels, but the brash sat on clay and, as soon as the rains came, a number of springs that had been moving through the slopes unseen, began running over the surface. As luck would have it, we had poured the footings for the wall by this point, but the workmen suffered, moving through the mud in slow motion to build the wall and then constructing a series of steel-edged beds. Mud stopped play not long after but, as soon as the weather was dry enough the following spring, the beds were soiled up to the depth of a generous spit. I graded the beds, starting with narrow metre wide beds at the windward westerly end of the garden. These were planted with the woody currants, gooseberries and raspberries to provide some wind protection. All the paths between the beds are a metre twenty wide to allow plenty of room for a barrow and growth to encroach from either side. 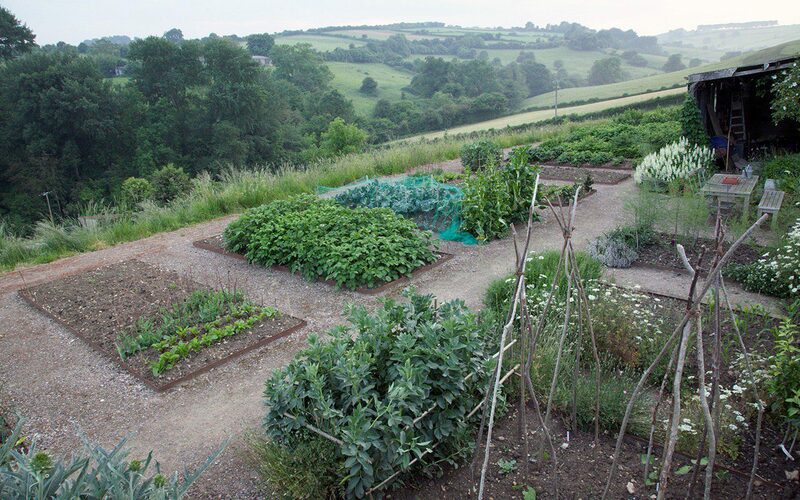 The beds scale up in size to one and a half metres and then two metres wide, but no more, so that it is easy to work the beds from either side without having to tread on the soil more than necessary. That first summer we left the majority of the beds fallow, removing perennial weeds and mulching them with manure, which we dug in over the winter. We did plant a couple of the beds with brassicas and winter sown broad beans to make us feel like we were moving in the right direction. Last year was our first summer growing in this new space and we are learning again with a new position and the challenges that come with it. 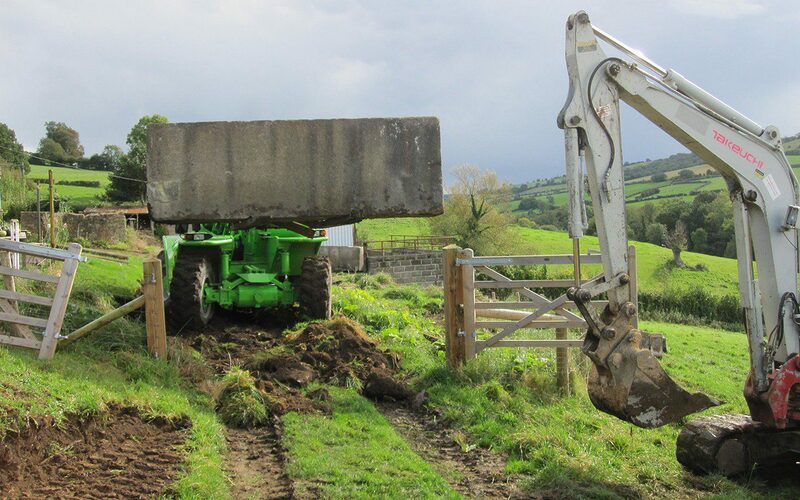 Our knees and backs are certainly better for the flat ground – we can move about freely without having to watch our step – but we are finding that some crops are missing the protection afforded by the hedge in the old garden. We are working on the soil with our own compost this year and talking about making a couple of the beds no dig next year. But for now, the summer and whatever it will teach us, lies in waiting.